If you are like me, you may have spent part of your weekend at a graduation ceremony. If we were having coffee I would have handed you a to-go cup and tell you all about it while driving to the weekend festivities. My youngest daughter, LAM (initials), graduated from her university early Saturday morning. She received her Bachelor of Science degree in Recreation Therapy. She will start her fall internship at an Oregon hospital as a recreation therapist working with patients who have psychological problems. Read more about this profession here. What I have just described is the end (and beginning) of a long, circuitous route for LAM. Her first job in high school was as a lifeguard working indirectly for me (poor thing). Even with several years in aquatics working with children, teens, and adults, she wanted to pursue a college degree in physical therapy or nutrition science. Both noble professions. She was lucky to play collegiate volleyball for two years, earning her AA degree at a community college. But that is where the road took the turn. Once she started at a four-year university her focus changed. Sadly she did not continue, but left school and moved to San Diego. If we were having coffee, this is where I would tell you how frustrating it was as her mom to feel so helpless. We want to help our kids and smooth the way for them, but this was not going to happen. Although LAM was surrounded by other family members in San Diego, she became depressed and out of sorts. 15 months later she came back home. Within one month of being home, she and her car were involved in a rear-end collision. Adding to the stress was a mild injury and me having to find her another vehicle. (I sold her mine, and bought me a new one). Moving back home was the balm LAM needed to get back on her feet. But, watching her best friends graduating, buying homes and getting jobs, was not helping her self-esteem or depression. She needed a fresh start. Like other times before when I gave her some advice (although she was stubborn about taking it), we discussed the Recreation and Parks major (where I got my two degrees), with the concentration in Recreation Therapy. She already had some exposure to this working as a lifeguard, where she helped people of all ages with disabilities in the aquatics setting. Like the proverbial Phoenix, rising up out of the ashes, albeit, one feather at a time, she started down a new and refocused path. This road included going back to community college, taking classes and holding a higher grade point average so she could be reinstated to her university. Only 12% of students who end up on academic expulsion return to graduate. If we were having coffee, this is where I would pause to take a deep breath so I don’t cry. The road led her to this moment, when she walked across the stage yesterday, then, ceremoniously, turned her mortarboard tassel to the left. 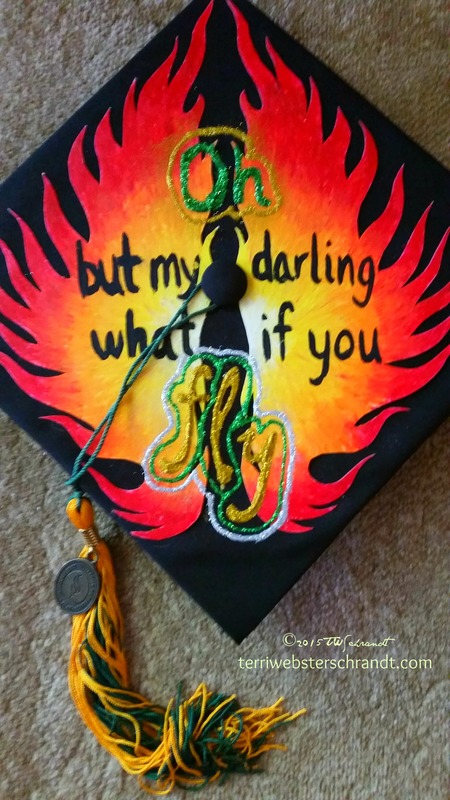 I lost it when she tossed the mortarboard into the air symbolically releasing the Phoenix! 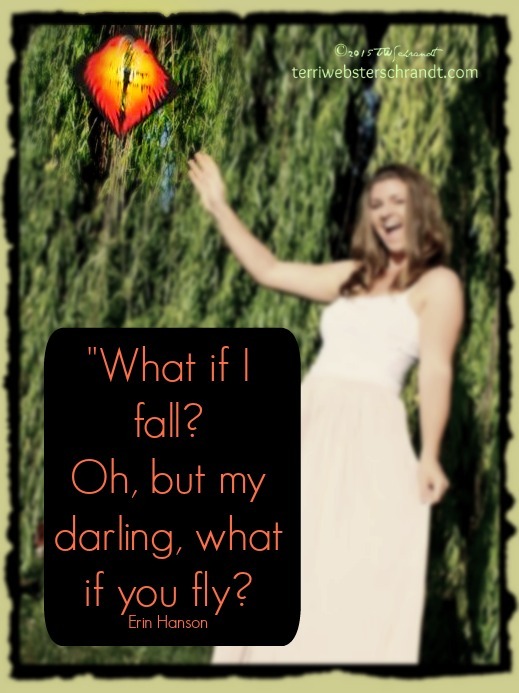 Yes, my darling daughter, you certainly did fly! Update three years later, LAM (Lauren) has worked successfully as a Recreation Therapist in the California State Department of Psychiatric hospitals and is currently back in San Diego with the Department of Corrections working in a State prison. It is so wonderful when our little birds take flight on their own. Our son has taken a very roundabout way to get to where he wants to be. But he is almost there. Sometimes it’s just the journey! They get there! What a great outcome Terri. Our daughter had a depressive episode part way through her uni degree and came home for a semester. She gathered herself back together, changed meds, sorted out new accommodation in the city and moved back, finished uni, met her husband, got a teaching postion, got married and has never looked back. It’s so wonderful to see them succeeding isn’t it? Thanks, Leanne! And congrats to your daughter on her journey. Isn’t it a relief? Such a lovely story to read Terri. Well done to your daughter and so wonderful to hear she is still doing well and enjoying what she does. My daughter (and youngest) just recently turned 23. She started out doing Drama/Acting but soon realised it wasn’t going to provide the stable income that she desired so quit and worked for awhile before returning to University to do Journalism … which eventually turned into a double degree of Journalism and Communications. She graduated last year. Oh my, that was a wonderful way to phrase that story. I love the idea of sitting down with coffee and sharing. My 16 year old son suffered a setback this morning which he attributed to the sky falling, (it was not). I didn’t tell him the truth. There is more coming where that came form. Such is life, growing up, etc. Thank, Leanne. I see more students every semester struggling these days. How wonderful! The university president said, one you have your education, no one can ever take it away from you. Congrats to you and your daughter! I hope she enjoys her new profession. I’ve worked in a few (rehab) places with recreation therapists. It can be a very rewarding career. Unfortunately, I feel it’s one that doesn’t get the recognition it deserves. In the few places that have them, in my experience, there was only one in a facility. I believe it is as important as Physical Therapy (my profession) since it keeps your spirits up and keeps you motivated. thank you very much for that comment!! The whole leisure profession unfortunately is first on the list of cuts in bad times and in those bad times is when we really need it! I appreciate your support! I have such a good job of reading all these posts and comments. That was certainly heart warming Terri. Tell your daughter we are all here cheering for her, cheering her on to a bright and satisfying future. Flying she is. Thanks Kathleen! I showed her this post and she was very touched! I have been through a very similar situation with one of my own daughters. She eventually graduated from law school. I wish in the tough times I could have known that it would all work out- it would have made me worry less. I understand your feelings of jubilation and relief! I am happy to have found your website. I, too am a former college professor,now working as a freelance writer and adjunct. We write about similar things. I just signed up to follow you. It’s a relief for sure! Thank you for the follow and I am now following your blog. I just commented on your sleep post! Thank you so very much, Estelea, it was a long circuitous journey with amazing happiness at the end. Oh Terri, you brought tears to my eyes at the end there. What a beautiful post. I’m so happy that she persevered and got there in the end. It just goes to show what family support can do for a child. Bless. Terri, I’ve got a big lump in my throat as I read this post…What an amazing daughter you have and what an amazing inspiration you are for her! I can imagine the pride and joy you are all feeling now upon her graduation…and the phoenix from the ashes is a perfect symbol for your daughter…In fact, it is a symbol I too share…Such power and strength to move from deep below to a higher plain….I know your daughter will be a great success in her new life path…and she’s lucky to have you and your family to support her! Congratulations to you all and here I am, virtually clicking coffee cups with you, in a sign of “Cheers”! Lia, I was weeping as I wrote this. When I discovered the poem on her hat I lost it. I would love to hear your story sometime. Thanks for your sweet comments and enjoy your memorial day weekend! Oh, Terri! I’m choked up reading your reply! The mortarboard was awesome in fact! Creatively made and really meaningful! Have a lovely rest of the weekend as well…! Congratulations to LAM for returning to college and graduating! Thanks, PJ! Hope you are enjoying your memorial day weekend! I am! I hope you are too. And now it’s reality. Congrats to your daughter! I know firsthand how hard it is to go back. My own college journey took exactly 30 years but I did it. I sensed the San Diego connection on one of your other posts when you mentioned Old Town. I use to travel there for work and found some great food in that area. What a wonderful story! Sometimes I think that, at the age most people start college, they are often (mostly?) too young to really know what they want. A few years of community service between high school and college would help focus their dreams and goals. And, of course, college doesn’t even make sense at all for some. I’m so happy your daughter found her path. Thank you, Cheryl, it’s been a journey!